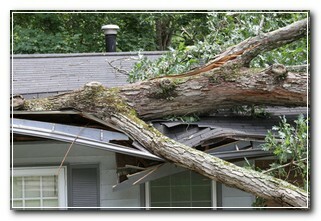 Arizona Home Insurance: Does My Policy Cover Fallen Trees? As summer slowly begins turning to fall, you may be starting to notice leaves and branches dropping on your property. Have you ever wondered if your home insurance would cover you if a tree fell and caused damage to your property? What if a neighbor’s tree falls and takes out a storage shed? Is the cost of removing a fallen tree covered? Here are answers to some frequently asked questions about when your homeowners policy covers fallen trees. If a tree falls and hits my house, am I covered? Usually, yes. Most homeowners insurance policies cover damage caused by fallen trees to your home or to other insured structures such as garden sheds or detached garages. Unless you purposely cut the tree down so you have an excuse to remodel your kitchen, it typically doesn’t matter what made the tree fall. Natural causes such as wind, lightning, or ice are all normally covered. My neighbor has a big tree close to our property line that I’m concerned may fall. If my neighbor’s tree damages my home, am I still covered? Again, yes. Regardless of who owns the tree, if it damages your home you can still file a claim with your insurance company. In strong storms trees and branches can turn into projectiles that cause considerable property damage. In most of those cases, your insurance company will be concerned with the damage to your property, not where the tree came from. If a tree located on your neighbor’s property falls due to disease or lack of care, your insurance company may try to recover costs from your neighbor’s insurance company. If this happens, you may be reimbursed for your deductible. Removing a fallen tree can be expensive. Are those costs covered? If a tree damages your home or another insured structure, your insurance company will most likely cover the cost of removing the fallen tree. If the tree falls on its own and does not damage property, the cost of removing the fallen tree does not typically fall under your homeowners coverage. The couple down the street paid for some pricey landscaping and woke up one morning to find that someone had stolen several trees and bushes. Am I covered if that happens to me? Most homeowners insurance policies cover loss or damage to trees and shrubs from various causes, including fire, lightning, vandalism, and theft. Coverage for damage or loss of trees is typically limited to 5% of the amount of insurance on your home. There may also be a $500 limit for any single tree or shrub. If you have questions about how your homeowners policy protects you against damages from fallen trees or branches, contact your insurance agent to discuss your needs and ensure you are fully covered.